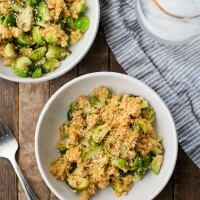 Fried Millet with Brussels Sprouts | Naturally.Fried Millet with Brussels Sprouts | Naturally. Heat the olive oil in a skillet over medium heat. Add the Brussels sprouts and cook for 6 to 8 minutes, stirring occasionally, until Brussels sprouts are browning. Add in garlic and cook for one more minute. Stir in the millet followed by soy sauce and vinegar, and cook for 2 to 3 more minutes. Create a well in the center and crack the eggs. Let them set most of the way, 3 to 4 minutes, before stirring them into the rice mixture. Stir in the sesame seeds and serve. + to get about 2 cups cooked millet, combine 3/4 cup millet with 1 1/2 cups of water or vegetable broth. Bring to a boil, reduce to a simmer, cover, and let cook for roughly 15 minutes until most of the water has been absorbed. Remove from heat and let site for another 5 to 10 minutes until done.